I liked La Cabana hotel, it was clean and neat but I had to walk (and it was long) uphill from station, which was very difficult with luggage. I don't know why nobody warned me earlier! If you are on a tight schedule you can go to Machu Picchu from Cusco on a day trip. So you can easily come back to Cusco from Machu Picchu on the same day. Hence it is not necessary to stay at any hotel at Machu Picchu. But if you are with family it is better to stay at least a night in Machu Picchu. But if you decide to stay Machu Picchu an extra one night you may get the opportunity to see the sunrise at Machu Picchu. Also there is another thing to mention here. Lots of people like to climb up Huayna Picchu. But each day at most 400 people can climb up (a restriction from Peruvian Government, to save the Sanctuary), and if you do not put your name on the list early, you may not get the chance to climb. So you need to go there early to take the chance. So spending a night there may not be a bad idea. But again to remind you, you can easily have your Machu Picchu experience without staying there. Decision is yours. At Machu Picchu ( which is actually Inca ruin, not a town now) there is only one hotel, Machu Picchu Sanctuary Lodge, which is just 150 feet from the ruins entrance gate. 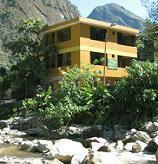 Other than this one all other hotels are situated at Aguas Calientes town (few miles from the ruins). Machu Picchu Sanctuary Lodge is a deluxe hotel, 5 star (that's what they claim), and naturally very very expensive. Rooms start there from $ 700.00. 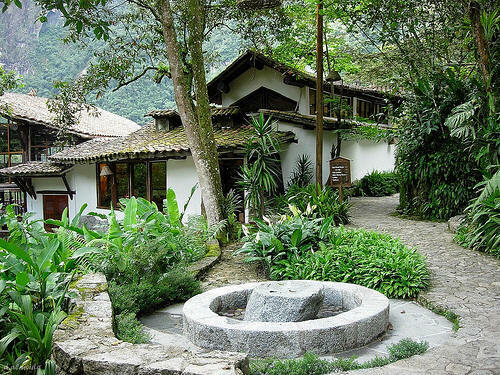 If your pocket is not that deep, you can stay at one of the hotels at Aguas Calientes. 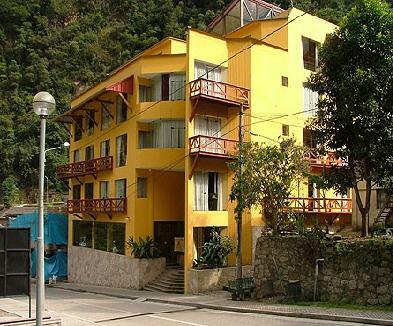 You will find plenty of hotels at Machu Picchu. 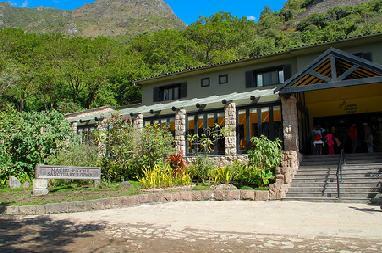 If you want luxury you can stay at Inkaterra Machu Picchu Hotel (Former Machu Picchu Pueblo Hotel). Here single rooms starts from $350.00 a night. Environment of this hotel is breathtaking, you will see gardens and tree all around in this hotel. If you are not interested in deluxe hotels, you can stay hotels like Hostal Continental or Hostal Machu Picchu, which are as cheap as $ 20.00 a night. 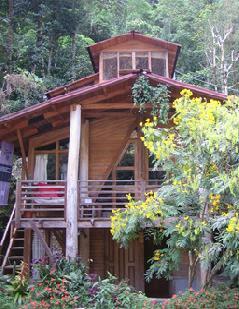 or Hostal Wiracocha Inn, Rupa Wasi Eco Lodge, Hostal Presidente which are $50.00 a night. For backpackers there are some hotels as cheap as $ 6.00. 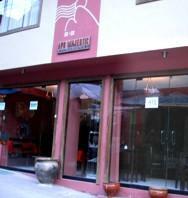 Hostal John,	Hostal El Inka, or Hospedaje El Tambo have rooms under $ 10.00. I am giving a list of Hotels below. If it says hostal, it means it does not have a restaurant. One more thing, room rates usually include 19% Tax, which is for Peruvian only. If you are not a Peruvian show them your Passport, and give them its copy to exempt yourself. 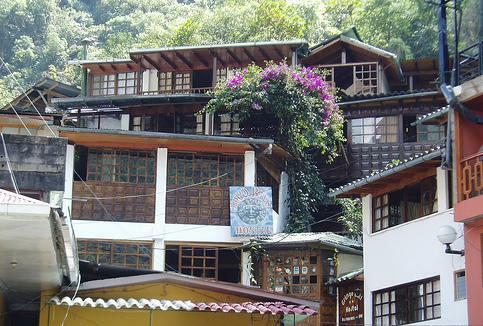 All hotels other than Machu Picchu Sanctuary lodge are in Aguas Calientes..
towards spring (north), then on your left. Probably cheapest hotel in Peru. Only 15 soles ($5.00) a single room, and you can get a seat for 10 soles ($ 3.00) in dormitory. Very Cheap. Starting from 10 Sole (yes, $ 3.00). per person. Naturally Very simple accommodation. Single rooms are $ 10.00. Basic amenities. Breakfast included. On the Left of Central Plaza. This one is also very cheap hotel. With $ 6.00 you can get a room here. Here you can get a room under $10.00, and double under $16.00. Shared bathroom. You can have beds for $5.00. They have 4, 5 even 6 or 7 beds in a room. Very cheap, starting from $ 6.00. Not much clean though. You may get hot water. From $ 15.00. Breakfast included. This one is very simple, all rooms are with private bath. Single rooms are $ 6.00 and double rooms are $ 12.00. Rooms are basic. You may get hot water here. Around 1 km just next to the bridge. If you like to spent a night in a camp, you may like it. They have some basic facilities. The hostel is little far, at the end of Pachacuteq Ave, from the Plaza, closer to the hot springs. But if you email them they will pick you from stations. A small hotel, reception built in the Inca style. Rooms are small, But decent. On the main rail road. Credit card not accepted, No phone at room. This one is very friendly. Breakfast Included. Recently renovated, Small house. Location is very suitable. Run by family. Very small one. Attached bath with hot water. Small two storied hotel. Total 18 rooms. All rooms have attached bath with hot water. New modern hotel..
You will get hot waters here. Breakfast included. They have 30 rooms. Best in the town. No TV at room. Rooms starting from $ 50.00. A small two storied house. The walls are made of timber and look interesting. Not a deluxe one but certainly comfortable, Attached bath. No internet. They arrange lunch bags for the guests, which is handy when you are out for Machu Picchu ruins. Recently renovated, spacious rooms with large windows and fantastic views. private bathroom with all rooms. Continental or American breakfast included. You have to go to uphill from Central Plaza. It is also a small hotel with 24 rooms. They have a reception in the Train station. This hotel was a famous one, but now a bit old (Built at 1979) and their service has become very poor. A bit expensive. Credit card accepted. Rooms are over $100.00 for two persons. This hotel is located just next to central plaza. A small two storied building. Equipped with modern furnishing. Attached bath. Some rooms have bathtubs with Jacuzzi jets. No internet connection. Rooms starting from $150.00. Rooms are specious. Clean Bathroom. Food may not be that good. Those who enjoy breakfast in the morning may stay somewhere. Have internet connection and Cable TV. At the entry point of Machu Picchu Citadel. Only hotel at Machu Picchu. It is situated just at the entrance point of Machu Picchu ruins. It maintains very high standard. Hence very expensive. The best thing of this hotel is that if you are interested to go to Huayna Picchu, you can get into Machu Picchu ruins very early from here easily. But bad thing is that , most visitors find it is over priced. Was it a great stay, or were you deprived ? Let others know! If you really like the hotel you stayed, you may share it with our other visitors. If the hotel did really a good job, should not they be appreciated! So let's share your thoughts! Or if you think you were deprived, let the other visitors know! I enjoyed my stay in this hotel. My good luck was that I got a room on riverside. Their breakfast is not that good though. Jack M.